All transactions are safe and secure with a reliable history in online purchasing behind each of our associates. 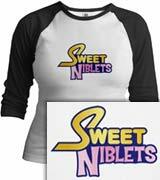 Buy the Sweet Niblets t-shirt to own Hannah Montana clothing and merchandise. Add this sweet niblets tee to your collection of Hannah Montana clothes. What does the phrase "sweet niblets" mean? No one knows for sure exactly, but we do know that a niblet is a kernel of corn. This explains the variations of the quote heard on the show, such as when Hannah's dad, Robbie Stewart, uses the phrase "sweet frozen niblets!" The Hannah Montana quote "sweet niblets" is similar to the idiom "jiminy crickets". In addition to the Sweet Niblets tee above, browse the Hannah Montana Clothing Gallery for more apparel like men's and women's clothes, kids shirts or hoodies.